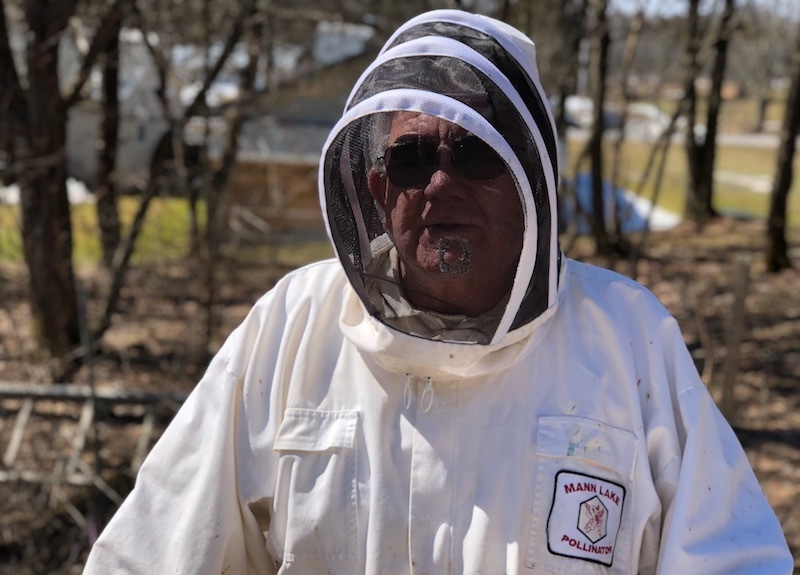 On this episode of Working: Syracuse, we put on Tim Hoda's white beekeeping suits to experience up-close what it's like to tend to thousands of tiny, honey-crazed insects. 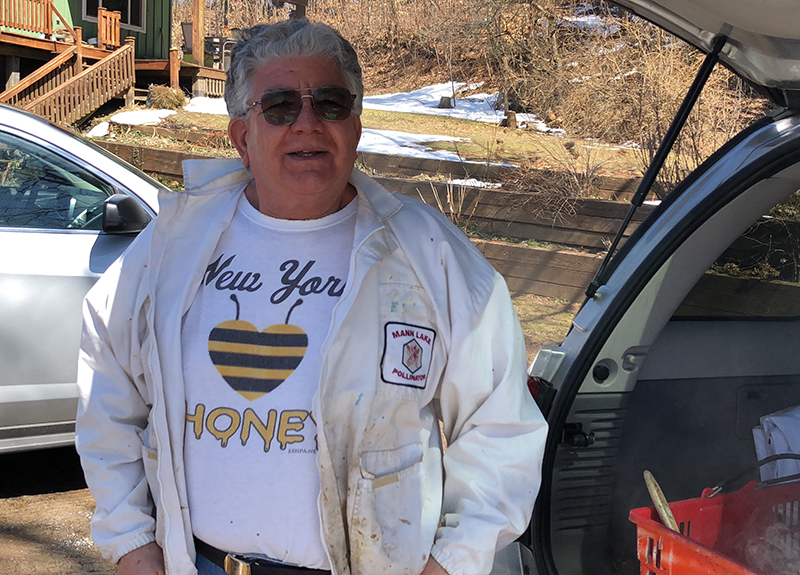 Hoda keeps bees at four locations, including his hometown of Taberg, N.Y. As a beekeeper, Hoda uses his bees to create products such as bee pollen, chapstick, and beeswax candles, which he sells through his business, the Rainforest Spice Company. Despite the tropical name of his company, Hoda faces less-than-sunny weather challenges in Central New York thanks to the long, harsh winters. Last year, the season took 80 percent of his bees. In fact, the phenomenon known as "winter kill" accounts for the annual loss of about 50 percent to 60 percent of the state's bee population. Fortunately, all of Hoda's hives survived this winter. Most years, Hoda compensates for his lost bees by ordering nucleus hives, which are small, honey-bee colonies derived from larger colonies. Bee colonies are always in high demand in the spring. So Hoda often splits the nucleus hives and sells them to other beekeepers for $150 a piece. A strong hive will produce about a 60-pound pail of honey in the first year, which means Hoda will break even with the purchasing cost. The spring is an exciting time for bees and their keepers. Sources of nectar and pollen become available, and the hives' occupants begin to grow and work. The fall requires even more time-consuming activity. Hoda begins to use the leftover honey to make products to sell at farmers' markets and distribute to small health-food stores in the area such as Natur-Tyme. "I think dealing with bees is quite interesting," says beekeeper Tim Hoda. "Not a day goes by that I'm not fascinated by it." Hoda keeps his numbers relatively small, managing about 45 hives between four locations. Removing dead bees is an annual ritual for a beekeeper — especially after winter. 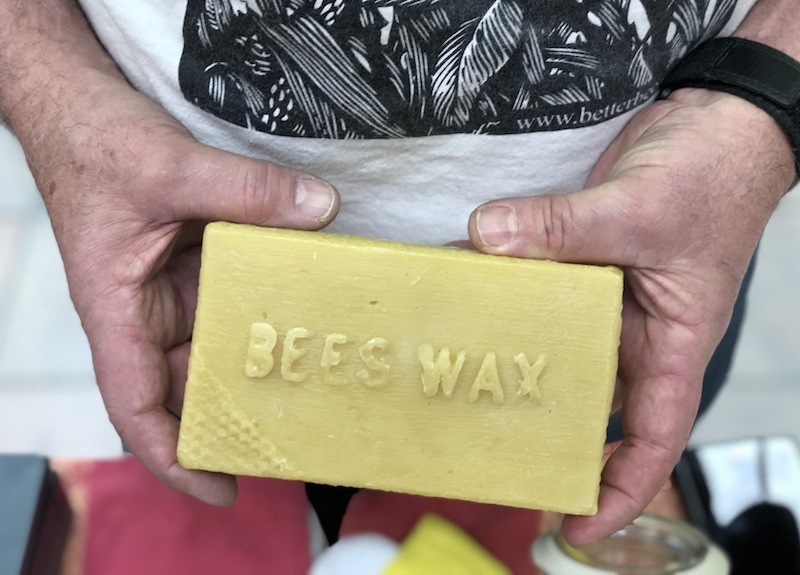 Hoda uses his bees to create products such as bee pollen, chapstick, and beeswax candles, which he sells through his business, the Rainforest Spice Company. Hoda participates in local farmers' markets year-round and also distributes his products to small grocers such as Natur-Tyme. On a visit to Eastern Europe in 2001, Hoda learned his ancestral family crest featured a beehive, a detail that reinforced his commitment to the practice. Tim Hoda has been a beekeeper for more than 30 years. 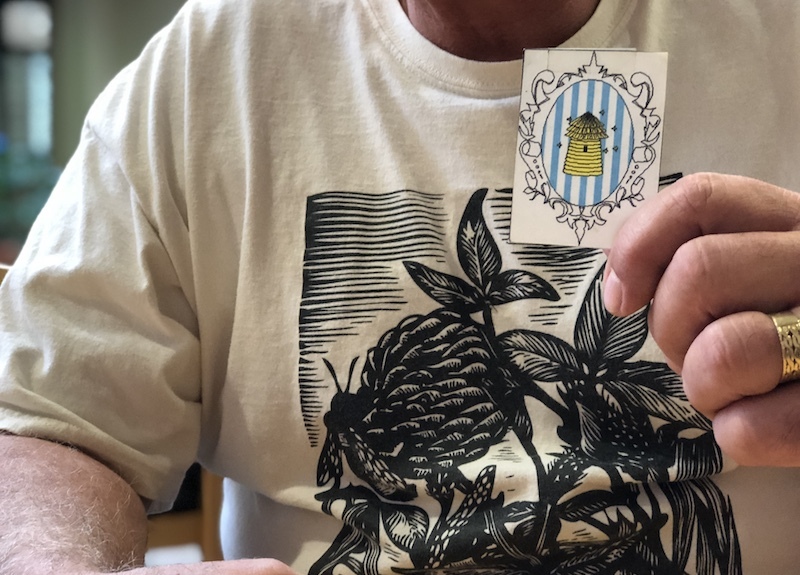 On a visit to Eastern Europe in 2001, he learned his ancestral family crest featured a beehive, a detail that reinforced his commitment to the practice. 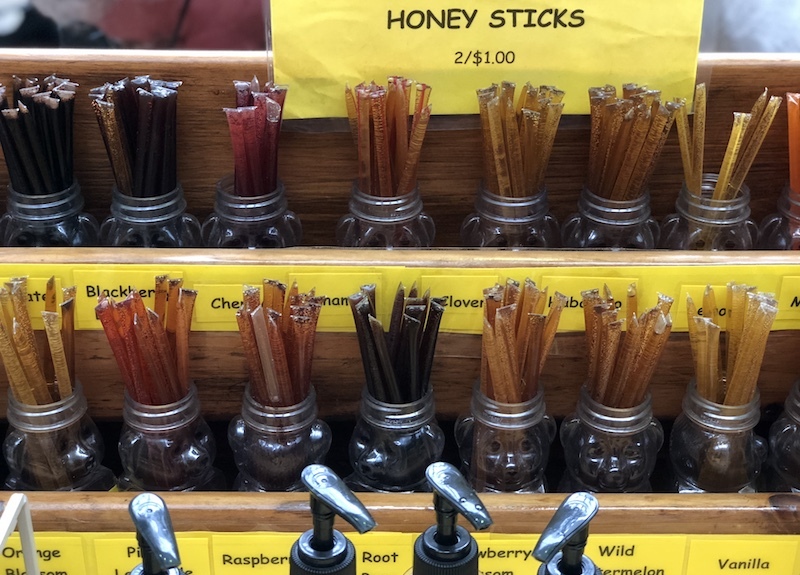 As a beekeeper, he spends each year collecting honey, making it into products like chapstick, honey sticks, and candles, and then selling the products at farmers' markets in the area. In fact, for 18 years, bees and the honey they produce have served as his primary source of income. Hoda spoke with our reporter Sarah Kinzler about the life of a beekeeper and what his bees have taught him. TIM HODA: The more I read about it, you know how it was an archetype society where some of their strongest attributes was of, how would you say, altruism, you know. The bees exist, they have no sense of self, they exist for the good of the larger community. TIM HODA: Hi, my name is Tim Hoda I'm a beekeeper. SARAH KINZLER: Thousands of bees bustle around the ten beehives in Tim Hoda's front yard. Peering outside of the window from the kitchen, it's impossible to miss the clunky light blue boxes shielding the hives from the cool winter air. By mid-July, he'll have 60,000 bees, with each one producing only a quarter of a teaspoon of honey in its lifetime. Hoda reflects on how the short lives of the bees have taught him about death, community, and family. But when he began, bees just seemed like a nice compliment to an earth-loving way of life. TIM HODA: We live a pretty low carbon lifestyle and bees would fit in nicely, so I ordered a couple bee packages and started reading up. I love the research and independent study. I'm fascinated by the whole biological aspects and the sustainability. The bee society is very specialized, every bee has a role when a bee is first hatched, it starts out right in the nursery, maintaining exactly where it came from, taking care of the young bees. In the society, if it does a good job, it escalates to a higher level. SARAH KINZLER: No level is higher than the queen bee. Unlike an average bee, the queen lives for up to three years, naturally making her the leader of the hive. TIM HODA: It's a maternal society where it's the queen is like controls the whole operations of the hive through pheromones, through its scent. And, the queen will send out a pheromone saying, "we have a nectar on, everybody go out," and specific bees as I said before go after specific types of flowers and if the bee finds a big field of clover, it'll come back to the hive and it will tell everybody where this field is through using, the alignment of the sun and it's called a waggle dance. It goes into the hive, and through this dance, it gives the bees coordinates of where to go - go around the big oak tree, hang a left, go up the hill, and it's amazing how they do that. And this is very proven and scientific. SARAH KINZLER: For the queen's bees to work efficiently, the hive must be looked after. Guard bees, as the name suggests, protect against intruders seeking to raid the hive. TIM HODA: Their whole purpose, they're committed to maintaining the integrity of the hive and, not, keeping out wasps and yellow jackets and any kind of, even mice will come in and try to get into the hive -- great place to spend the winter by the way -- nice and warm and lots of nutrients from the honey and but the guard bees, they give their live cause they only sting once, and after that it's the end of their existence. SARAH KINZLER: Tim believes the social structure of bees is reflected in human society. Male drone bees work outside of the hive to mate with neighboring queens. Sadly, their life will end shortly after—fulfilling their sole purpose. House bees work inside the hive to clean and tend to the queen. All the bees take ownership of their jobs and devote their lives to doing those jobs well for the good of the hive. TIM HODA: And they're so committed to maintain that, they're aware that it's going to cost them everything to protect the hive and they're more than willing to do it. 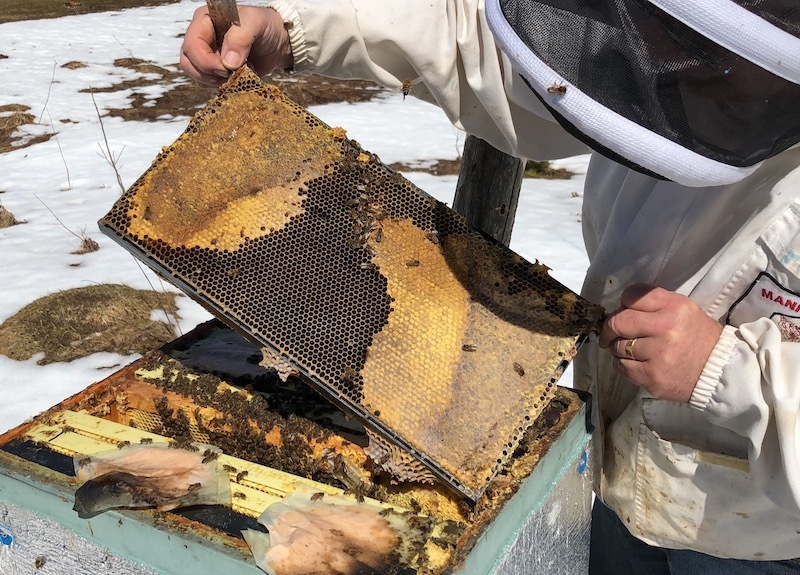 SARAH KINZLER: The activity of the bees changes between different seasons and the weather, which in Central New York often means it is unpredictable. TIM HODA: There's an old Beatles song about the "Fool On the Hill" that lives his life by the seasons. I said, that's what I wanted to do. Ya know, and spring is a real exciting time. SARAH KINZLER: Springtime serves as one of the busiest times of the year, and a beekeeper must decide how many hives to maintain. In New York State, about 50 pounds of honey are produced from a single hive. Often times, Hoda checks his hives at least once every two weeks. TIM HODA: 'Cause you know you're building up your hives and you're trying to get 'em going and get them ready so that they thrive so when the first flowers bloom and you really build your... how busy you want to be throughout the season, one is based on how many hives you want to manage you know, because, you know, I know some people, they run 800 hives, you know it's their whole life. SARAH KINZLER: Hoda keeps his numbers relatively small, managing about 45 hives between his four locations. A key part of the maintenance work is feeding the bees. To do that, Tim makes sugar and honey-filled patties that he places on the top of the hives to help boost honey and nectar production. TIM HODA: First thing that we do is we have something called patty parts, I have one of those hamburger squashers and we'll have three people come together, I mix up a whole bunch of this, it's basically sugar, some mineral salts, I put some honey in there, some bee pollen in there, and essential oils, and what it is, it's like a feeding stimulant that the bees have and it really get em really going good. SARAH KINZLER: Tim often gets his two granddaughters, Maya and Bria, involved when they come to visit. During the springtime, they enjoy helping out with the family business and share Tim's fascination for the flying creatures. While the honey is a sweet reward for their hard work, it isn't the only thing they gain from spending time with their grandfather. Hoda doesn't shy them away from the negative aspects of beekeeping. TIM HODA: Last spring, I was with my granddaughter and I lost a lot of bees, a lot of bees and, what you have to do is they call them, "deadout," the term is called "deadout" and you go through your bees and you take all the dead bees and you scrape em off into a pile and you clean up the hive cause when they sit in the hive and they start to rot, it's the most horrible smell, ya know. The corpses, rotting corpses of bees, you know, you could probably write a short story on it. SARAH KINZLER: Tim and his granddaughter aren't the only ones cleaning out the hives. The role of undertaker bees is also to help clear some of the dead-outs. TIM HODA: And my 8-year-old granddaughter was there with a brush and I was holding up the frames, brushing dead bees off dead bees, and ya know, got a good pile, putting them back together, getting them ready to introduce a new nucleus hive to em. And we were going down the line she kept sayin, "Poppa, is this one alive?" I said, "No honey, this one's not alive, you know, going down a line, going down...So we did three or four and she realized, they're all dead, you know. And she said, "I can't do this anymore. I, it's making me sad. I have to go in." And she went in, she never takes a nap in the afternoon but she was so overloaded by grief. Ya know, from seeing these dead bees. SARAH KINZLER: Scraping out dead bees happens throughout the winter and into spring. But despite the morbid nature of his work, Hoda's job has informed his entire world view. TIM HODA: I remember way back when somebody saying what life is, is somebody finding a resource, and going back and telling everybody, telling the world what I discovered, ya know, ya know. I say, isn't that what it's all about? We find truth, and when we find a little essence of truth we say, "look what I found!" now maybe to us it seems much more important than other people but I said ya know, we discovered stuff, you know yeah, life is a discovery process. And if we don't stop looking, we're going to stop discovering. BRONTE SCHMIT, HOST: Thank you, Sarah, for sharing Hoda's story. He met his wife at SUNY Cobleskill. He asked if anyone knew when Thomas Edison's birthday was and she said, "February 11". Shocked, Hoda asked how she knew that. It was her birthday, and it was his too. They've spent every February 11th together since. BRONTE SCHMIT, HOST: That's all for this episode of Working Syracuse. Check out our website www.working syracuse.com for more interviews as well as some extra content on Tim Hoda. Be sure to follow us on Facebook and Twitter @WorkingSyracuse. Thanks again to Sarah for speaking with Hoda. This episode was written and produced by Sarah Kinzler and Will Muoio. Extra reporting came from Julianna Whiteway. Our theme music was by Logan Piercey. I've been Bronte Schmit, and It's time for us to clock out.